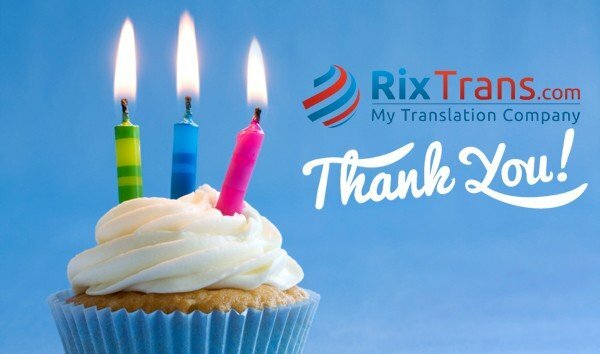 Today, on 29th of January, translation company RixTrans celebrates its 3rd anniversary. The road to success for a start-up is never easy, but we are very excited by the remarkable results we have already achieved – over 25 million words translated and edited in 312 language pairs for clients from 36 countries, along with our 99% project on-time delivery rate, are RixTrans’ 3rd anniversary milestones to be proud of. It would not be possible without our loyal clients, who have placed their trust in us by choosing RixTrans out of so many other agencies available on the market. We are truly thankful to each and every one of you. RixTrans’ business approach has always been aimed at having a limited number of highly satisfied regular clients rather than thousands who never come back with repeat orders, therefore our experienced translation project managers are always willing to walk an extra mile to meet and exceed the client’s expectations. This includes ensuring our service availability on weekends and public holidays, supporting clients in different time zones and, on some occasions, even making the impossible possible. RixTrans was among the first companies in the translation and localization industry to obtain the ISO 9001:2008 certification in only its third year in business. This prestigious award is just another acknowledgement of our commitment towards ensuring top quality translation services. At times when prices throughout the industry are dropping, translation companies have only two options to survive – choosing less qualified, therefore cheaper, linguists or reducing the costs by using a variety of techniques and high-tech tools. RixTrans’ commitment to every client is to never lower the price by sacrificing the quality of work. Instead, we have optimized our company’s internal processes by implementing a specialized project management system that combined with investments in the latest translation tools and industry-specific employee training, allows us to maintain high quality standards while keeping costs down. RixTrans’ vision is to build a company that can ensure uninterrupted translation and localization services 24/7 in any language pair 365 days a year. Thanks to our client trust, we have been able to grow both in company size and revenue, therefore we are planning to hire new staff to work in different time zones, who we hope will help bring us one-step closer to our goal. Please stay tuned for updates. Thank you for being our valued customers. We are grateful for the pleasure of serving you and meeting your translation needs.